It’s the team’s third year for a championship but the first in the harder category. 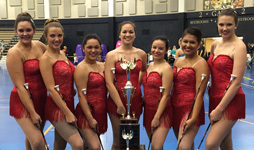 For the third year in a row, the Texas Tech University Twirlers earned a national championship title at America's Youth on Parade National Baton Twirling Championships at the University of Notre Dame in South Bend, Indiana. This year, though, the trophy is bigger and better than ever before. 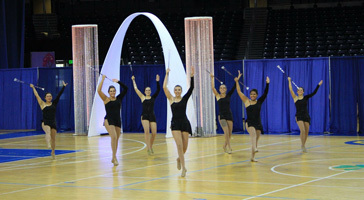 The seven twirlers – Lyndzie Allbright, Adrianna Chavez, Camille Crawford, Claudia Hernandez, Allyson Padron, Sydney Webster and Rachel White – brought home a traveling trophy for winning the National College Half-Time Championship, besting teams from more than 70 universities throughout the nation. Texas Tech has attended the competition for the last six years, placing well but just missing the top spot. 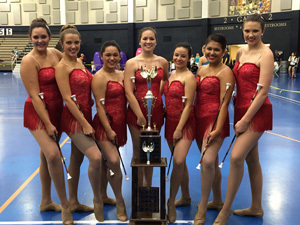 In 2013 the team won the senior division and in 2014 won the small dance twirl championship. 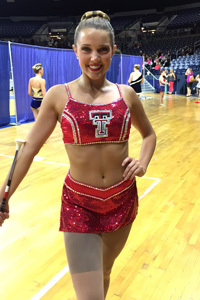 Although they're recognizable to most Red Raiders from their routine on the football field, the twirlers' competition season begins almost as soon as football season ends. When classes start in January, so do practices – once a week during the semester and three to four times a week during the summer. It's about 15 hours a week leading up to the tournament at the end of July. Crawford, a senior from San Antonio studying human development and family studies and pre-physical therapy, said the team won the state competition in June, which qualified them for nationals. It was her third time to go. Webster, a public relations major from Lubbock and the line's featured twirler, went to South Bend for the ninth time this year. She's been going individually and with other twirling teams since she was 6 years old. This year she took second place in the regional competition and first place at the state tournament and competed in the individual category along with the line at nationals. She finished 12th this year after redoing all of her routines the night before the competition. She, Tolley and a couple of other twirlers redesigned her movements to not irritate a strained hamstring, which had hampered her ability to practice and perform her prepared routine. “Overall it worked out great and I'm so pleased that I, along with the other girls on the team, was able to adjust to the circumstances and make it work,” she said. Webster, who will be a junior this fall, plans to return to Notre Dame for the competition next summer. Even with an injury, she still had a good time. “It's so interesting to hear all the fight songs and see the girls representing their schools,” she said. The team has scattered for a short break before football halftime performances get started again. When they come back, the trophy that is theirs for a year will be cleaned up – Tolley said it's starting to show its miles – and plan for their seventh trip to Notre Dame. Duane Hill, the director of the Texas Tech Goin' Band from Raiderland, said he and the rest of the band faculty are proud of the twirlers' award.